Mamais Design/Build services provides our clients with a single point of responsibility for constructibility, cost, quality and schedule adherence. As a design/build contractor, we are able to consistently exceed our client’s expectations. With Mamais, our clients in-house administrative burden is lessened, reducing the time and cost generally allocated in the typical design-bid-construct process. Mamais also has many resources, including industry leading architects and designers. Depending on the project’s scope, Mamais creates a custom and appropriately functional team to support our client’s project. Mamais Construction Management teams are characterized by experience, diligence and professionalism. As Construction Managers, Mamais maintains the construction site’s overall conditions, including ensuring a secure and safe work environment. In the pre-construction phase our management team helps our clients avoid costly planning and design oversights. During the construction process, we effectively plan, organize, and control the overall project. Mamais project team keeps the owner updated on the project’s cost, schedule and general workforce activities. In the post-construction phase, Mamais assists in the testing and documentation of all new equipment and building systems. 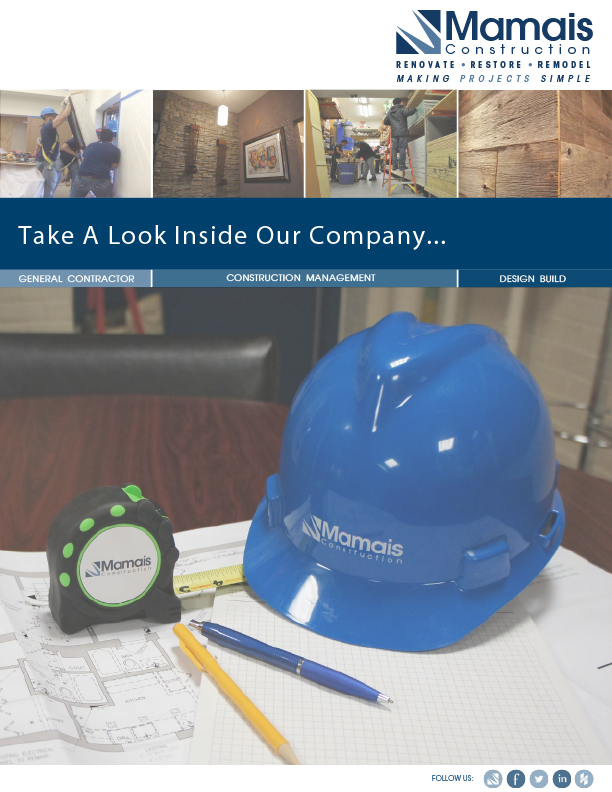 While functioning in the role of General Contractor, Mamais is able to leverage our extensive constructive experience, and operate as a General Contractor using our highly skilled in-house workforce. This provides Mamais and our clients with a strategic advantage. Operating with a proactive methodology, our construction management team look to eliminate problems, not to react to them. Our construction services staff and field supervisors consistently interact; following a system of checks and balances insuring project milestones and schedules are accomplished. Our project team proactively meet with our tradesmen to ensure that the overall project goals are met. All of the listed services are performed by our trained in-house staff of tradesmen. We have the unique ability to control the quality and timeliness of every project. This makes us a great choice for any project. Mamais has perfected and sophisticated all of our services, and we take pride in our accomplishments. We have worked diligently to complete numerous complex projects successfully. We value, and place great importance in completing our projects in a timely and cost efficient manner. We also provide planning and scheduling throughout the construction process to produce the appropriate sequence of activities to achieve maximum efficiency and productivity. For specific information on our completed projects in any category, please contact us and we will provide you with the project details.